…and by beach, I really mean the pool! Anytime I leave the house, especially with Camryn in tow, I have to make sure I have all the essentials. The pool is no exception. With that said, I also don’t want to be hauling around a million products that I don’t need, because a wet toddler is already a handful enough! 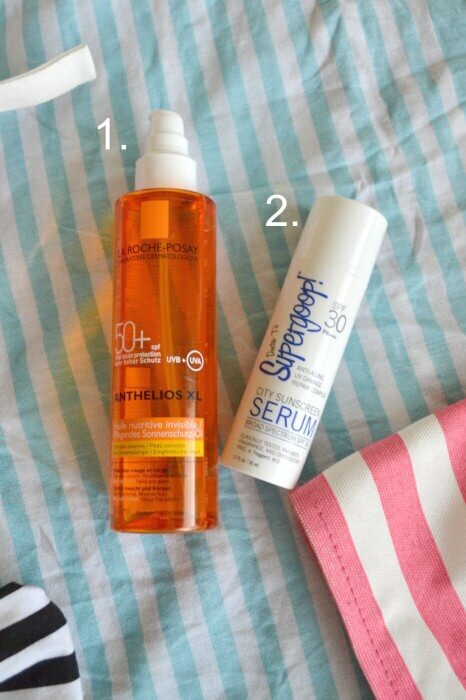 Here are my must-have pool/beach bag items. Lets start with the most obvious – a good pool bag. I got mine last year from Barnes & Nobles for $10 with the purchase of a book. It’s large, easy to clean, and came with a palm tree keychain that was Camryn’s jam for weeks. *Winning* I always pack a sun hat, water (add cucumbers to stay hydrated and reduce swelling), and a good book or trashy magazine. My mom and I have both been wanting to read The Fault In Our Stars, so I bought it yesterday for her to read while she’s visiting, and then I’ll read it after she finishes. 1. Camryn has fair skin, and I’m trying to not look old yet, so a good sunscreen is a must. I bought the La Roche-Posay Anthelios XL 50+ spf UVA/UVB oil in Paris last fall, and instantly fell in love with it. It’s geared towards sensitive skin, or people with a sun allergy. It claims to prevent sun spots, especially in pregnancy, and is water-resistant and hypoallergenic. I feel extremely safe putting this on Camryn’s skin, as well as my own pregnant belly. It feels incredibly hydrating, and has prevented sunburn even in the 100 degree texas weather. It’s unfortunately not sold in the U.S. but can be bought through Boots and shipped internationally. 2. Supergoop facial serum is one of the only daily sunscreens that I can use without noticing a build-up of oil and acne. It’s lightweight, less fragrant than other facial SPF’s, and hydrates my skin while fighting discoloration in my skin. I use this everyday before applying my makeup, and apply it multiple times while hanging out at the pool. 3. My beloved wet brush. I couldn’t live without this brush. I have extremely thick, long, and curly hair that tangles if you look at it the wrong way. A day in the pool or at the beach does serious damage to my hair, and I’d be helpless without my wet brush. It’s less than $10, and it does the job of an army on my tangled tresses. Every lady should own one. Enough said. 4. 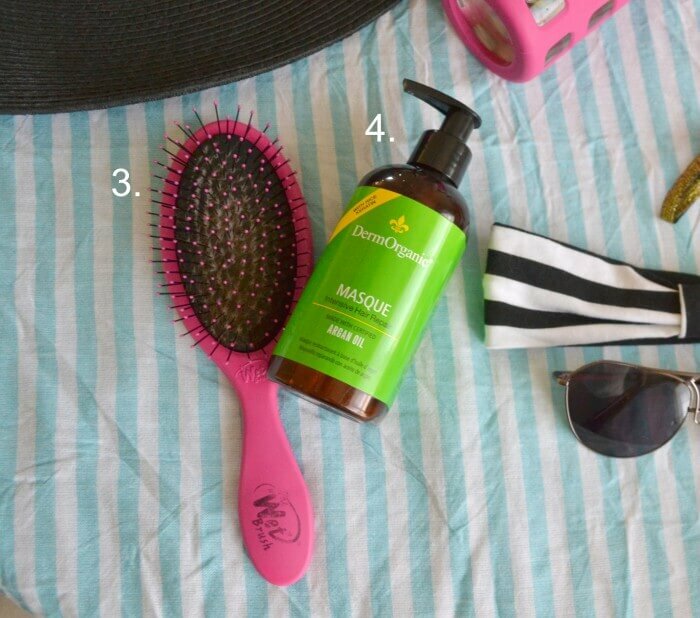 A hair mask – really any good hair mask will work, this is just what I’m trying to use up. It’s a great product, and I especially like the DermOrganics argan oil, but it’s not one that I’m saying will change your life. If you have long hair, or color treated hair, do yourself a favor and pack a deep conditioner. Your hair will thank you. 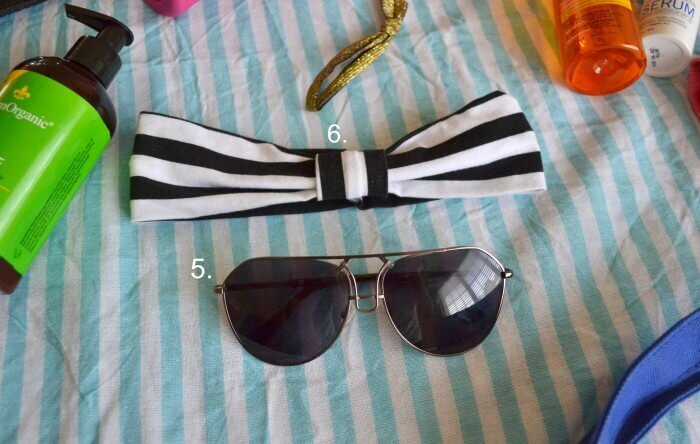 Last but not least, a cute headband and hair tie to keep your moisturized hair off your face, and a pair of sunnies. My black & white striped headband is from Little Big Dreamers (and is actually Camryn’s, but dangit it looks cute on me! ), and my sunglasses are from House of Harlow (no longer available). I love taking these in my beach bag because they don’t press down on my cheeks like some sunnies do. I hate when sunglasses touch my cheeks and get makeup or sunscreen all over them, and leave red lines on my cheeks. Camryn loves these glasses too, and has been seen sporting them here, and here. 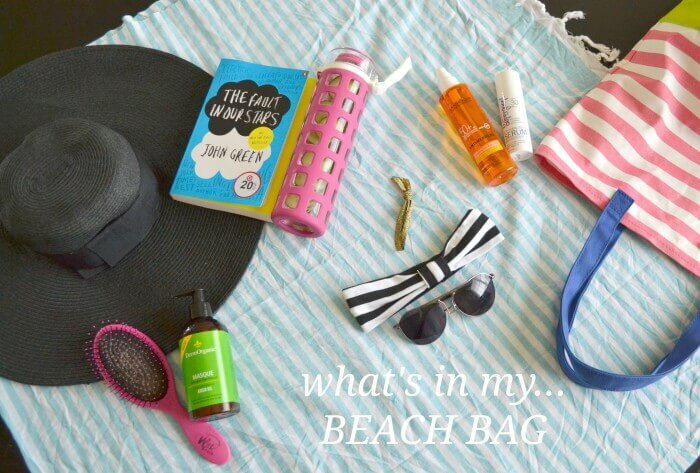 What do you keep in your beach bag? Tomorrow I’ll share my beach bag “beauty essentials” that take me from sweaty beach bum to bronzed babe in minutes. My mom is flying in today, and will be staying with me for 10 days, so I won’t be posting on Thursday, but you can catch me back on Friday. Side note: Moms are the best, aren’t they? I called her a few months ago, right after getting pregnant, in full-blown panic mode stressing over my house being cluttered, and needing to purge before baby #2 arrives…she booked a flight that week and is coming to be super-mom and help me organize and have a garage sale to get rid of things we don’t need before bringing in new furniture and baby stuff. Best. Mom. Ever. She is also the queen of laundry, so I may have stopped washing all my clothes last week in anticipation of her arrival. Outside of making her do days and days of hard labor (like painting Camryn’s room, and the nursery) we’ll also be enjoying a few pool days, ballet classes, pedicures, and movie dates.